Goodwin College is pleased to announce that the Hartford Foundation for Public Giving has approved two grants for the Math Lab, located in Room 219 at One Riverside Drive. The Math Lab offers tutoring support as well as online learning modules, allowing students to master concepts at their own pace. The Lab is staffed with peer and professional tutors on a walk-in and appointment basis. Students are encouraged to ask questions and seek assistance in this supportive, accommodating environment. The grants are from the Samuel Roskin Trust and The Right Track Fund at the Hartford Foundation. These generous grants will allow Goodwin to purchase over 100 graphing calculators. They will be lent out to students, who will return the calculators at the end of the semester to be used by the next student. This initiative will be especially helpful to those who cannot afford to purchase a calculator. “These donations will have a tremendous effect not only on the Math Lab, but on Goodwin as a whole. We are always seeking ways to improve the College and help students succeed, so we truly appreciate the generosity of the Hartford Foundation for Public Giving,” said Marion Leonard, Director of Grants and Planned Giving. Goodwin thanks the Hartford Foundation for Public Giving, the Right Track, and the Samuel Roskin Fund for these generous grants and looks forward to enhancing the Math Lab and assisting our students. The Hartford Foundation for Public Giving is the community foundation for the 29-town Greater Hartford region, dedicated to improving the quality of life for area residents. It receives gifts from thousands of generous individuals, families, and organizations and awards grants to a broad range of area nonprofit organizations. For more information, go to http://www.hfpg.org or call 860-548-1888. Justin Greene and his wife, Casey Sholes-Greene, have been married for a little over a year and are expected to graduate from Goodwin College in May of 2014. Justin will be graduating with a degree in Medical Assisting and Casey with a certificate in Phlebotomy. Before they became familiar with Goodwin, Justin was working part-time at Home Depot, and Casey found work as a certified nursing assistant. After seeing commercials that highlighted the College’s career-focused degree programs, Justin decided to make a positive change by furthering his education and signing up for classes at Goodwin. Inspired by her husband’s example, Casey enrolled at Goodwin in search of a promising career as well. “My husband said it was a great school. He highly recommended it to me,” Casey recalled. The couple was up for the challenge, and they have been each other’s source of support and encouragement along the way. “It’s nice to live with somebody who will help motivate you,” Justin noted. Many students come to Goodwin with a specific career in mind, but all have the common desire of significantly changing their lives for the better. “I didn’t just want a job; I wanted a meaningful career. I wanted to do something more,” Justin said. 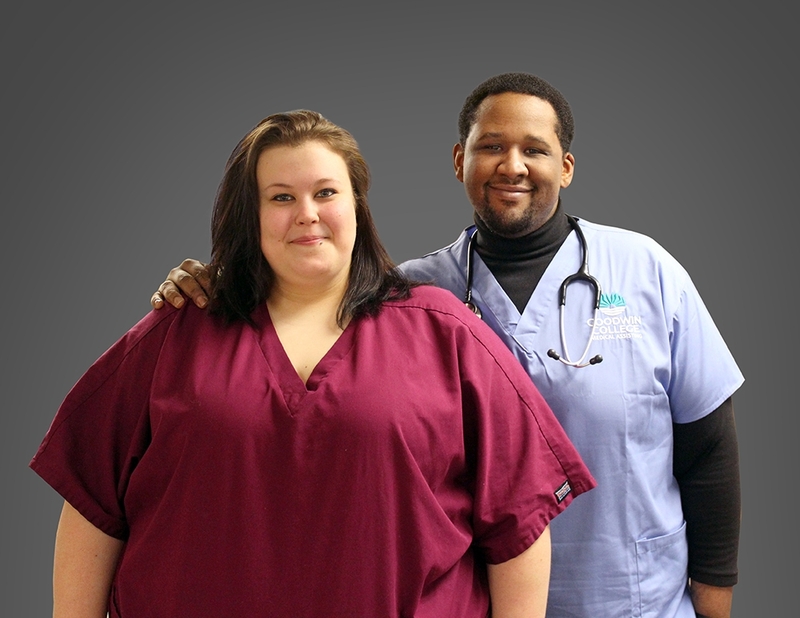 Initially, Justin entered the Medical Billing and Coding program, but eventually was attracted to a career that would allow him greater interaction with patients, so he enrolled in Medical Assisting. “Medical Assisting at Goodwin is preparing me for a career where I can continuously challenge myself,” Justin stated. Casey also feels positive about the knowledge she will be taking with her after graduation. “Goodwin taught me about responsibility. I didn’t know much about the health care field before coming to Goodwin, but now I feel confident in my abilities,” Casey said. The health care field is something Justin and Casey are both very passionate about, with plans to come back to Goodwin to obtain degrees in Nursing. “We want to further our careers and continue learning,” Casey stated. Trading in the rice and flowers for caps and gowns, Justin and Casey will be walking down yet another aisle together with high hopes and expectations for their future. An “institution of milestones” added two new highlights to its collection on Friday by celebrating the early success of its manufacturing initiative. Goodwin College joined with Pratt & Whitney and the students who completed the CPT program in celebration of milestones. Goodwin College held two ceremonies on its River Campus, one honoring the first cohort of students to complete the Certified Production Technician (CPT) program, and a second thanking Pratt & Whitney for its generous support and investment. 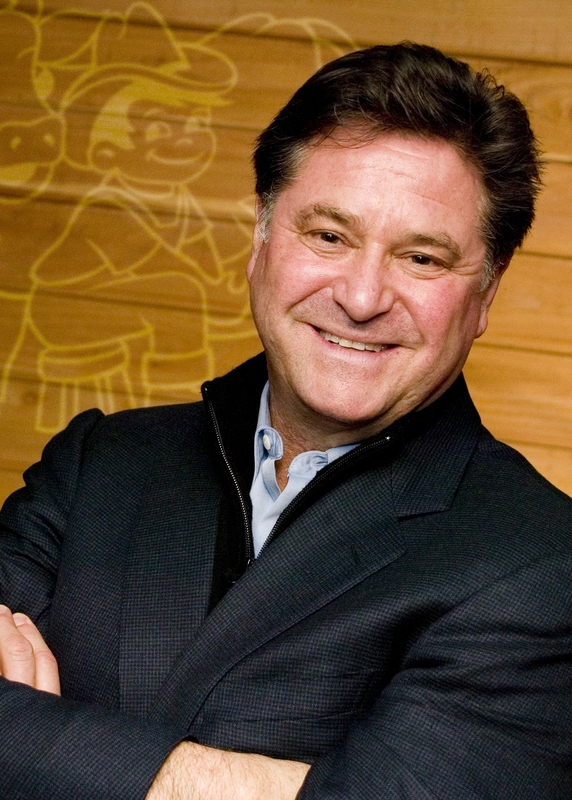 The latter gifted Goodwin with a $125,000 donation aimed at helping the College grow the program and in turn support the development of Connecticut’s workforce. 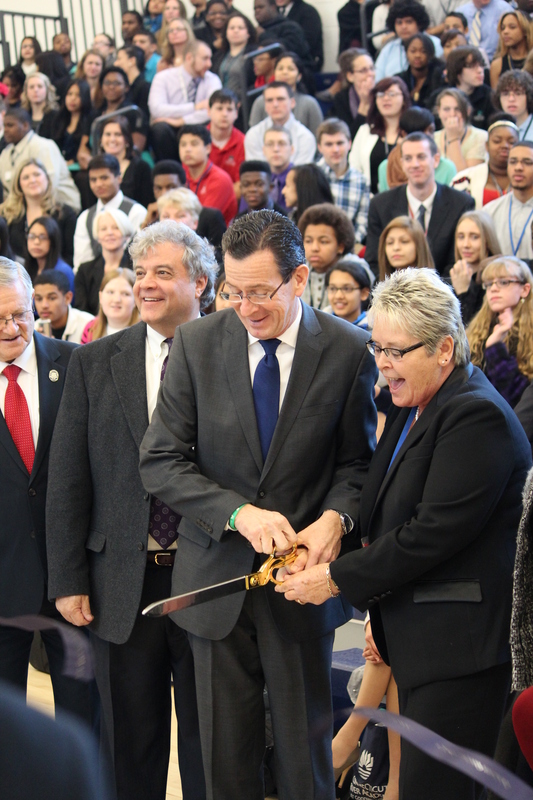 “Even while Washington was stalled in a quagmire, Connecticut moved forward,” said Congressman John B. Larson, an East Hartford native, who was instrumental in helping Goodwin to create the program. 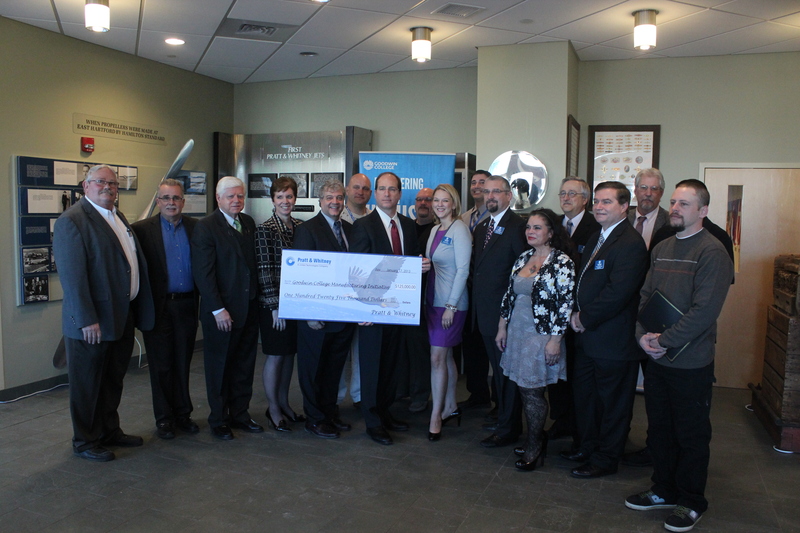 Pratt & Whitney presented a check to the College during a ceremony attended by many supporters of Goodwin’s Certified Production Technician program. The College launched the initiative in May 2013, becoming the first college in New England to offer a path toward a national and portable credential through the Manufacturing Skill Standards Council (MSSC). Goodwin President Mark Scheinberg, speaking earlier Friday to the first cohort of students to be credentialed, said that Goodwin was an “institution of milestones” that should celebrate the successes of the first steps in the manufacturing initiative. Joe Sylvestro, Vice President for Pratt & Whitney’s Manufacturing Operations, speaks at the check presentation. The College and Pratt & Whitney are natural partners in the endeavor, which has great potential for both East Hartford institutions. In fact, United Technologies, the parent company to Pratt & Whitney, had two employees who were among the first eight students to get the MSSC credential, which is attained by meeting high manufacturing standards. 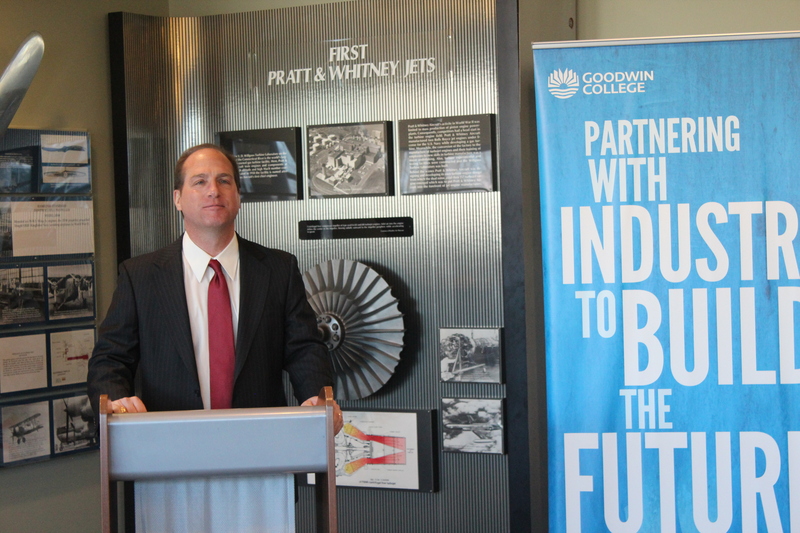 “We are very pleased to be part of supporting this fantastic program here at Goodwin,” said Joe Sylvestro, Pratt & Whitney Vice President for Manufacturing Operations. Sylvestro presented the check to Goodwin during the ceremony, which took place against the backdrop of antique Pratt & Whitney machinery now on display in the Goodwin College lobby. 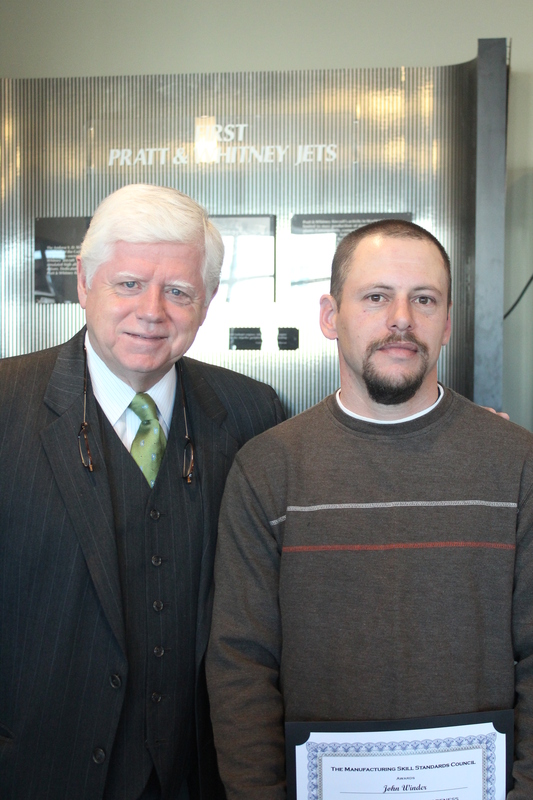 Congressman John Larson and John Winder of Alpha Q, one of the first students to be credentialed through MSSC. Congressman Larson commended Pratt & Whitney and Goodwin, as well as the local International Association of Machinists & Aerospace Workers members who were in the audience. Larson worked with IAM leadership to help develop the program initially, realizing that MSSC credentialing could benefit workers in Connecticut’s 1st Congressional District and the state as a whole. Given the economic climate and congressional gridlock, Larson said that the idea needed to move forward quickly. “There was no time to pause, and that’s why we turned to Mark Scheinberg and Goodwin College,” Larson said. Also present during the check presentation were many of the CPT students who had been honored earlier in the day in a separate ceremony that took place immediately before the presentation. Al Pucino, director of the Manufacturing Management program, presented the students with certificates honoring their achievement, noting that the CPT program is designed to aid current and future demands within the workforce. “There are positions to be filled, and we need qualified and credentialed people to fill them,” Pucino said. All of the students completed the program through the support of their employers, including several successful manufacturing companies throughout the state. The students’ supervisors attended reception in support of their employees. Recognized during the ceremony were John Winder, Brandon Truman, Olga Perez-Ivin, all of Alpha Q Inc. in Colchester; Stephanie Gregoire and Edwin Sandoval of C&P Manchine Co. in South Windsor; Stanley Rek Jr. of Pratt & Whitney; James Rotundo of UTC Aerospace Systems in Windsor Locks; and Paul Spada Electric Boat in Groton. 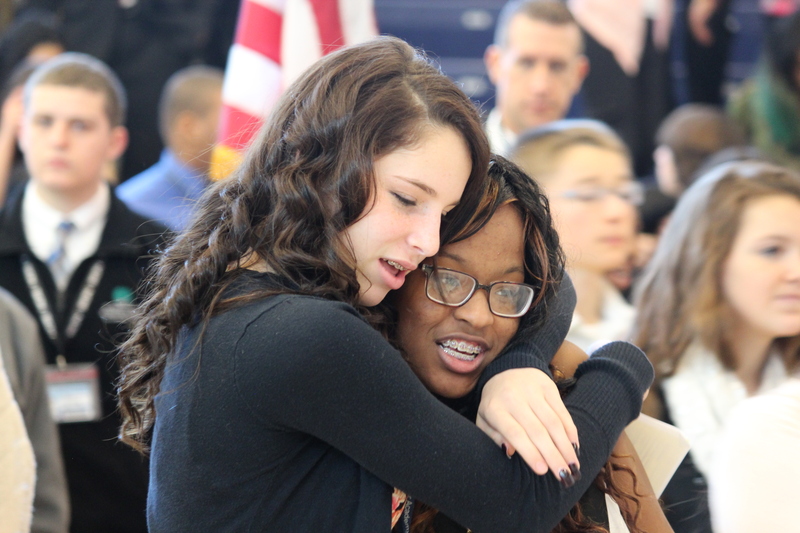 “We are incredibly appreciative of you for being willing to take the first shot,” Scheinberg said to the students. In addition to the CPT program, the College was recently accredited to offer a bachelor’s degree program in Manufacturing Management and associate degree programs in Quality Management Systems as well as Supply Chain and Logistics Management. 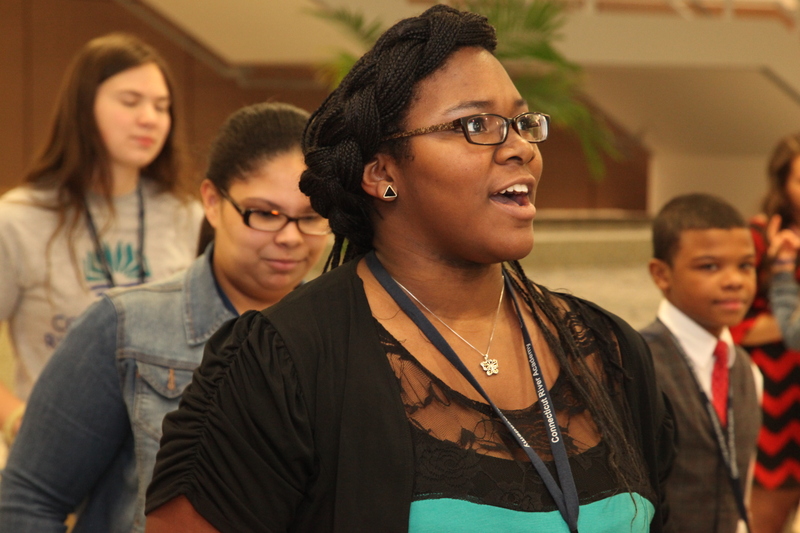 Photos of both the Credential Ceremony and the Check Presentation can be viewed on the College’s Flickr page.